The Congress on Tuesday released its manifesto for the Lok Sabha polls, making a slew of promises, including giving Rs 72,000 each to five crore poor families under the 'Nyay' scheme, filling up 2.2 million government vacancies, bringing a separate budget for farmers and fixing a single moderate GST rate. The 55-page document titled 'Hum Nibhayenge' (We will deliver) focused on addressing the issues of joblessness, farm distress, safety of women and boosting the rural economy, with stress on building a narrative on "real issues" faced by people. 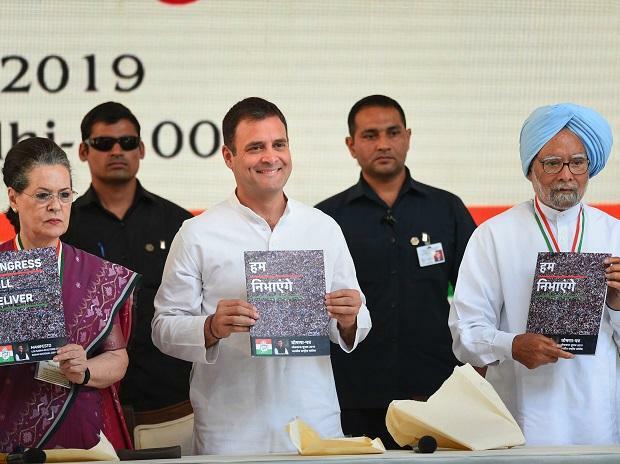 The manifesto was released by party president Rahul Gandhi, former prime minister Manmohan Singh, UPA chairperson Sonia Gandhi and senior leader P Chidambaram among others. For farmers, Congress promised to put them on the path from "Karz Maafi" (loan waiver), to "Karz Mukti" (freedom from loans). This will be done through remunerative prices, lower input costs, and assured access to institutional credit, the party said, adding it will present a separate "Kisan Budget" every year, if voted to power. Speaking on the occasion at the Congress headquarters, Gandhi said the Congress will allocate 6 per cent of GDP to education, strengthen government hospitals and give high-quality healthcare access to poor if voted to power. The party also promised to enact the Right to Healthcare Act and guarantee every citizen free diagnostics, out-patient care, free medicines and hospitalisation, through a network of public hospitals and enlisted private hospitals. The Congress president alleged that the BJP government had spread hate and divisiveness in its five year rule and his party will work towards uniting India by bringing people together. "Our manifesto process reflects our commitment to a higher vision, that of listening to the 'jan awaaz'. It is not the 'mann ki baat' of one individual but the collective voice of lakhs of people," he said in a preface of the manifesto. With this manifesto, Gandhi said the Congress has offered to people "the only national alternative -- a distinct alternative that is unwavering in its commitment to truth, freedom, dignity, self-respect and prosperity for our people." He promised to make India "strong and united, and a just and prosperous society". On the party's showpiece minimum income guarantee scheme or Nyuntam Aay Yojana (NYAY), the party's manifesto promised to give Rs 72,000 per year to the poorest 20 per cent households in India. To the youth of India, Congress pledged to make jobs its top priority, saying it will ensure 34 lakh jobs in the public sector by filling all 4 lakh central government vacancies before March 2020, persuading the state governments to fill 20 lakh vacancies and creating an estimated 10 lakh new Seva Mitra positions in every gram panchayat and urban local bodies. The party said it will also provide a fillip to private sector by incentivising businesses for jobs creation and employing more women. On GST tax, the Congress said it will radically simplify the GST regime with a single moderate rate of tax, zero rating of exports, and exemption for essential goods and services. It also promised panchayats and municipalities a share of GST revenues. The Congress, it said, will reverse the trend of declining defence spending under the NDA government, and increase it to meet the requirements of the Armed Forces. "We will expedite all modernisation programmes of the Armed Forces in a transparent manner. We will improve social security, education and health facilities for our Paramilitary Forces and families," the party said. On education, Congress promised that school education from Class I to Class XII in public schools shall be compulsory and free. The party promised to pass in the first session of the 17th Lok Sabha the Women's Reservation Bill reserving 33 percent of seats for women in the Lok Sabha and the State Legislative Assemblies. "Congress will also reserve 33 percent of all posts/vacancies in the Central government for women," it said.